The traveller sat down on a bench, his body’s heater working so hard it had turned his nose red. It had forgotten about his fingertips though. He shoved them deep into his pockets to steal some of the warmth from his spoiled lower body. It used to be that it took lots of math and meteorological mumbo-jumbo coupled with knowing where Mars was in the night sky for him to know what the snow meant – but now he just had a feeling, located along his spine, that would send tingles through his entire body when he woke up. They wouldn’t subside as he brushed his teeth, either, like other spine-tingling emotions. The traveller knew that if he was ever scared, the best way to get rid of the creepy feeling was to brush his teeth. This snow was not like other snow. Most other snow is encased in a protective covering to keep you from getting to the uniqueness inside the flakes – something having to do with the electrons and the frozen hydrogen bond’s vibration. The ozone layer changed everything, though – the ozone layer would restart the vibration and send the electrons spinning in the opposite direction and the protective covering dissipated and suddenly, all those brilliant snowflakes opened. These snowflakes were falling universes. Sometimes the world inside the snowflake was just mildly tweaked. Donuts weren’t tasty, perhaps – the preferred snack of cops changed to Oatmeal cookies (no raisins). Other times, the snowflake world was incomparable to our own. Colors changed their dynamics, the feeling of “home” would never exist (except in the Traveller’s heart), the idea of warmth and happiness would be replaced with other emotions and exothermic descriptions. But the snow was ubiquitous. The cold, falling universes were universal. The traveller’s grandfather was the one who explained how it worked. When the traveller was young, his grandfather took a small test tube from the freezer. “This is where your grandma is. I’d go, but in there, she’s slowly forgetting what it’s like to need somebody.” And then, his grandfather explained what type of snow allows inter-dimensional travel, and how to do it: touch your pinkies together and hold them aloft and wait for a snowflake to fall. The boy thought about this for a long time – the loss of his grandmother, his sad grandfather, the snowball fights he had witnessed and participated in that could have resulted in paranormal travel. It wasn’t until he was 25 and feeling lonely and sad about his lack of employment, and lack of overall life meaning that he first held his pinkies aloft on his apartment complex’s roof and transported himself away from everything. Now, the traveller felt very sure that he had returned to the world he remembered from his youth and yet he wasn’t perfectly sure. Were evergreens always so spiky? Did light always glow around the edges like that, or was that a result of needing a new pair of glasses? He sat on his bench and kept his hands firmly inside his pockets. In a way, he felt like a failure, and he remembered that feeling vividly from the world he had left so long ago. His grandfather and grandmother had created his father. His father and mother created him. Even further back, his great great great great grandparents fought whatever fighting had to be done to survive and continue this branch of the family tree, and yet here he was, alone, still. Old. He closed his eyes and thought about the world where there was no age. People looked as old as they felt, and you could watch young ones transform to teenagers as they learned to kiss, or doddering old fools become thirty year olds at the drop of a hat when the thirst to prove themselves returned without reason. He liked it there but felt no allegiance to anyone. No one stayed who they were, they changed when they wanted to be someone or something different. The traveller took his hands out of his pocket to adjust his scarf to cover up his nose. The filaments from the wool framed the bottom of his vision. The grey strands looked like tired, colorless grass. Love could mean anything in the world he had come from, he remembered that because he felt that aforementioned love-type-feeling in a few of the worlds. The traveller would sometimes speak in one of these universes and he could remember saying, “I love the sky here,” and everyone looking at him perplexed, or “I love that dogs can talk here,” and dogs nodding but cocking their heads to the side and asking if that hadn’t always been the way. He wanted someone to come outside and tell him that they loved snow, or loved his scarf. He wanted that material love that was only available here, at home. When a couple of young guys came crunching through the snow, he said, “I love the sound of freshly fallen snow crunching beneath feet,” and they both looked at him funny and didn’t say a word. The traveller put his hands back in his pockets, and decided to stay put. He got up from the bench and decided to look for hot chocolate. Posted on Sunday July 25th, 2010 Wednesday March 26th, 2014 by Max Elman. 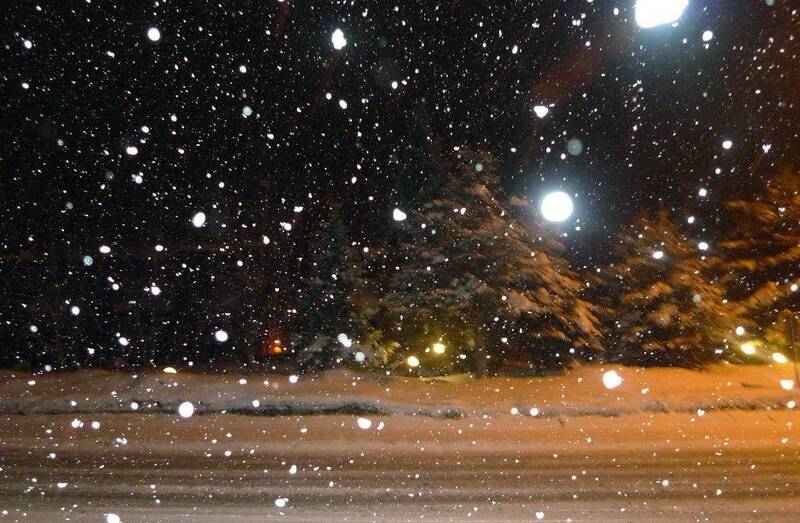 This entry was posted in Photos & Stories and tagged night, snow, sundance, utah. Bookmark the permalink. I really loved this one, but I think you need to work on snappier titles. I could suggest myself for position of Head Titler… oh god, that looks like it rhymes with Hitler, doesn't it? Title-er. Namer of Stories. I'm great at naming things, just ask everyone whose fish I've named. So if you need a Giver of Titles… just ask. Yep. Hm. Might have to hire you on a trial basis… Title for this one – go! When I read stories the characters always put their pinkies together and jump into my world and I see them in everybody I meet. There are crazy old guys everywhere. And now everytime I am afraid I may try brushing my teeth. My alternate title "And Yet He Never Flossed." I love this picture because I've only been snowed on twice. Once it wasn't even snow…it was something called natives cakked frozen rain (which at the time I thought, "Isn't that snow?"). However, if you are looking for a person to write titles, how about Drifter because eventually the snow will create drifts, and old guys can be drifters…it's a pun—sort of. Plus there's a teleportation thing which might also be a type of drifting. It just works on so many levels. At any rate…I'm also a good namer…just like Meg in Wind in the Door, by M. L'Engle.